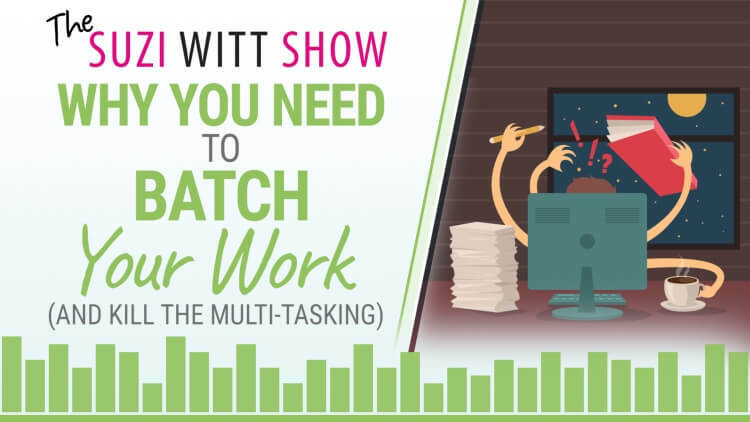 In episode 20 of the Suzi Witt Show, I am talking about batching of your work. It is no big secret that I am a big fan of batching because it allows me to get so much done. Tune in to this week's show to find out the how, the why and the when and whether it could also work for you and your business. Find out why a fear of mine led to a method of working that I love as it gives me scheduled free time. Listen in to how this started at a very young age and is probably the reason why I (and possibly you) prefer being self-employed. Learn what happens to your mind when you use batching for content production of your work. Learn what batch working is. Understand what batching really does behind the scenes. Listen to how you batch work so you have a ready made system to adopt. TSWS: 019 How to handle tricky customers. TSWS: 002 Why you need a brand and not a business. TSWS: 005 Twelve solutions to manage overwhelm in your business.